The booklet “Promise, Divide, Intimidate and Coerce: 12 tactics palm oil companies use to grab community land” has been launched today by GRAIN, the World Rainforest Movement (WRM) and an Alliance of community and local organisations united against industrial oil palm plantations in West and Central Africa, including RADD, SEFE, Synaparcam of Cameroon, Muyissi Environnement of Gabon and ERA/Community Forest Watch of Nigeria. 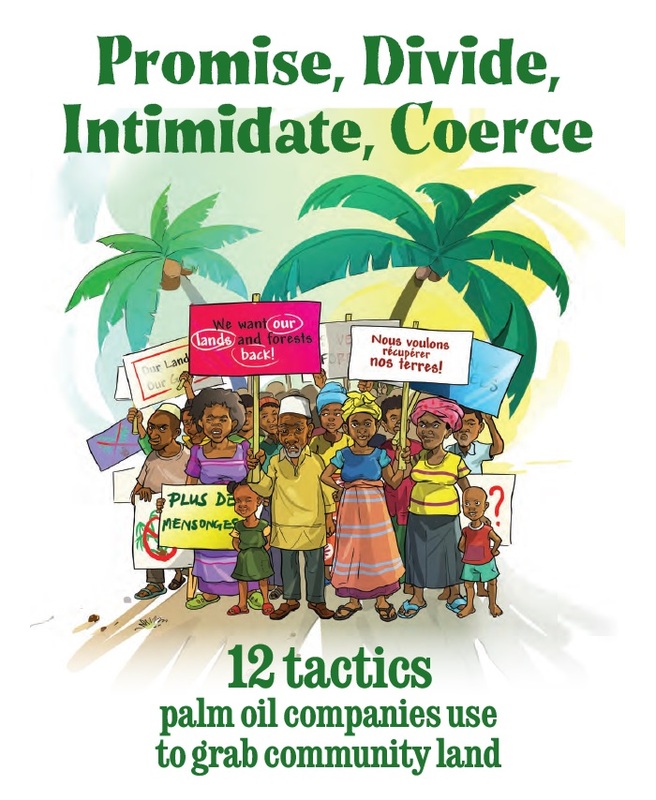 This booklet aims to support communities who want to strengthen their resistance and better prepare themselves to stop corporations from establishing industrial oil palm plantations on their lands. The booklet is available in English and French and can be downloaded and shared from here. Where necessary, they coerce, intimidate, harass and even have opponents to their activities killed. Villagers, especially in remote places, often think such violence, intimidation and land grabbing is only happening to them. Community representatives may initially believe the plantation company’s promises because they are unaware of community experiences elsewhere. The reality, however, is that violence – and in particular violence and sexual violence against women- is an inseparable part of the industrial plantation model and that the tactics companies use to take community land have been fine-tuned through decades of experience around the world. – How do companies trick communities into agreeing to give them control over their land? – Why are empty promises made by the company about generating local employment or health and education facilities so effective in convincing communities to allow them onto their land? – What can communities do to stop the theft of their land, and the destruction of the local water springs, creeks, rivers, forests and other places that are affected by the plantations? – What can communities do in situations where the company has already taken their land? – And, why do projects promoted by some companies and governments in which peasant farmers grow oil palm under contract for the company result in debt and poverty for participating farmers? This booklet is not a step-by-step manual that, if followed, will stop a company from setting up a plantation on community land. The objective of this booklet is to support communities who want to strengthen their resistance and better prepare themselves to stop corporations from setting up industrial oil palm plantations on their land. If a community is aware of community experiences elsewhere, it can more easily recognise company tactics. A community can then discuss different responses early on, so that when one way of resisting the company’s plans fails, the community can persevere and try a different way, while being prepared for new tactics that the company might use. We hope these descriptions of company tactics will inspire others to plan, prepare, and keep their communities united and to build alliances with neighbouring communities and regional or international networks. The booklet is a work in progress. We welcome feedback and suggestions for change.